What is First Step Speed- who cares? This weekend just passed I had the great pleasure to induct another six candidates through the first part of the 1st4sport Level 2 certificate in Strength & Conditioning. I have always felt (just my opinion) that S&C coaches are more comfortable in the gym than on the pitch and so excel in the resistance training part of the qualification, but get much more new information from the speed aspect. Personally I think this aspect is made more difficult when coaches seem to disagree on the technical model when it comes to how to get somewhere fast. 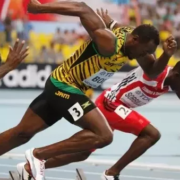 I tried to give the candidates as broad an overview as I could of the different types of speed and what to look for in terms of teaching cues that relate to the technical model of sprinting. Please note that there is a reactive component to all these types of speed which is accounted for in the APA method. However ‘reaction speed’ is something that is focused on in the ‘skill’ element of the APA system- which accounts for reaction speed of any movement not just a locomotive one. 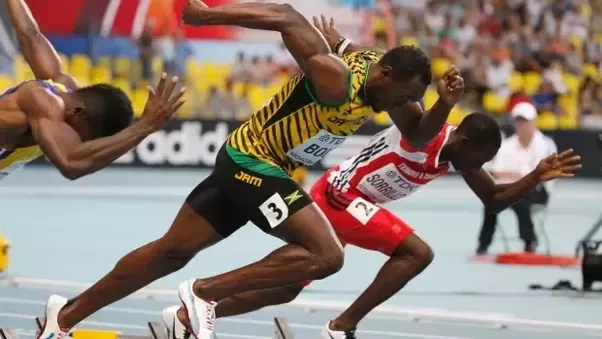 I started by showing them the image of Usain Bolt above which represents the technical model for acceleration (posture, arms and legs) during a 100m race. This is the most pure form of sprinting. We focused on acceleration during this qualification although highlighted some of the differences between acceleration and top speed. 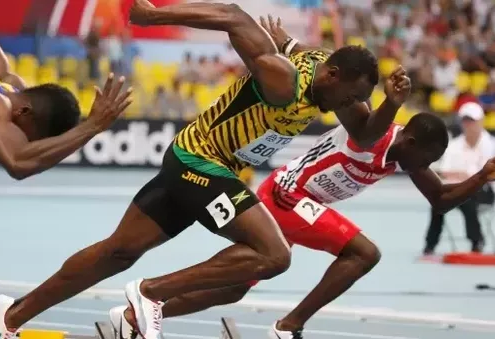 Acceleration during sprinting involves a ‘running step‘ which is the name I give to the action of driving the leg forward to propel the body forward. I like to progress on to First step speed (FSS) after Straight ahead speed (SAS) because the technical model of accelerating is still relevant. The focus is still on the running step. However, the initial body position will be different. Some coaches will call it quickness training, speed off the mark, or just speed. I like to call it first step speed because the actual first step (which is a explosive running step in the direction of travel) is still employed. But you might be going forwards, sideways or backwards. If the movement is planned you will see the athlete bias their weight over one of the legs so they can pivot from that leg. In a planned movement the first step is taken using a pivot step off the lead leg to allow the back side leg to come through. 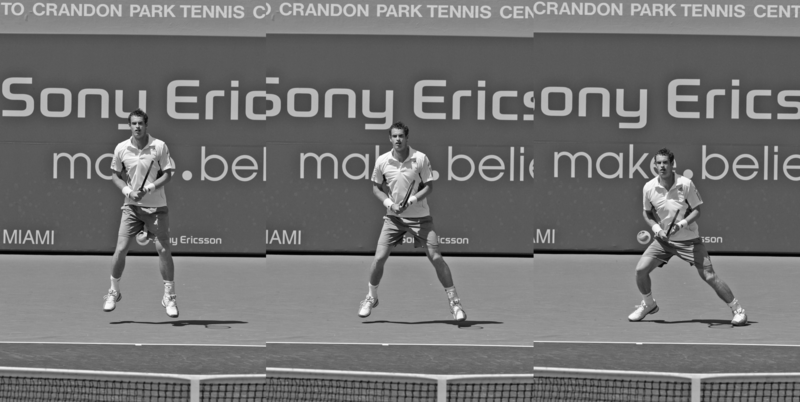 In this instance there is no ‘wasted’ movement away from the intended direction. I use the word wasted in inverted commas because some coaches talk about a false step being a wasted movement. In this situation it would be but it is important to realise when it isn’t- which we will come to next. 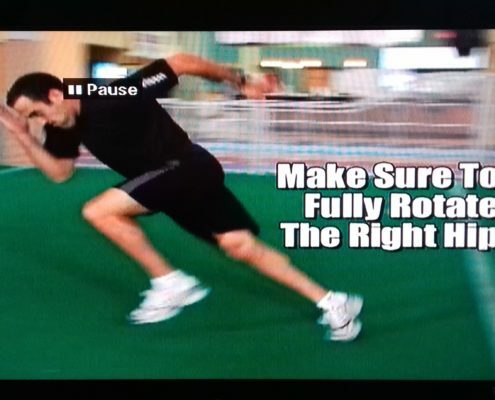 In the example above of a stance used for a planned 60Y Dash as part of a baseball test, the athlete knows they are going in a planned direction. There is no choice of Left or Right so they can pivot off inside leg closest to intended direction. 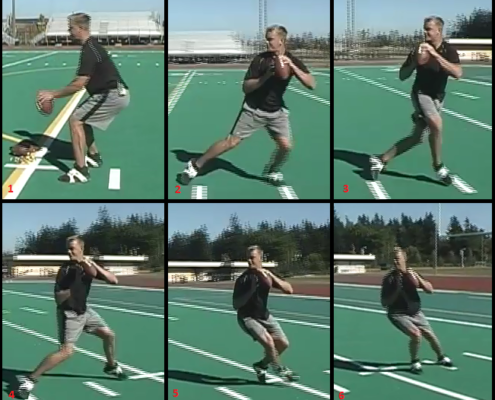 Reactive movement means the athlete has to quickly reposition their body from a neutral athletic stance to a position to produce optimal force in the intended direction. 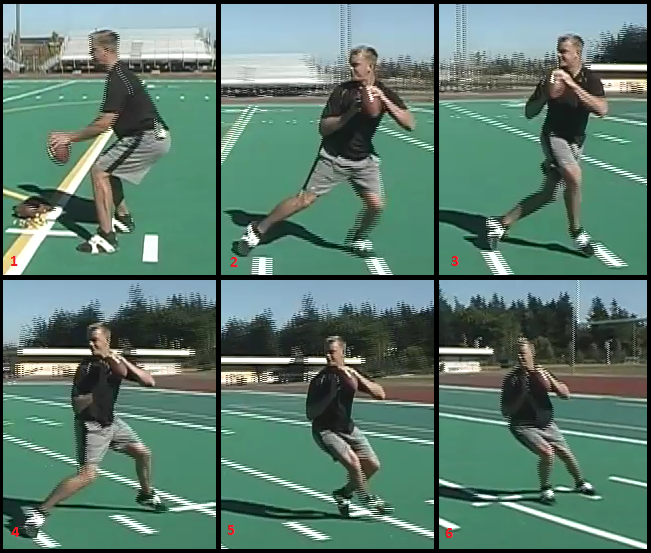 If the athlete has a choice, or has to react to a cue such as a ball drop you may see them use a ‘directional step’ of the lead leg to initiate movement. 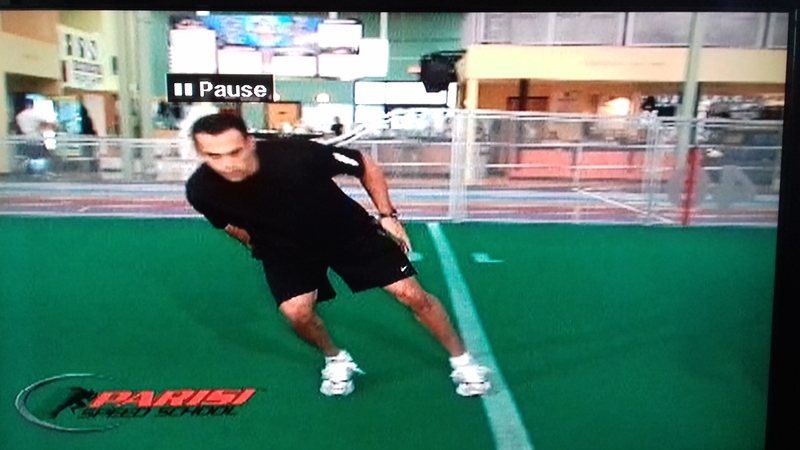 In the image below the athlete uses a directional step. 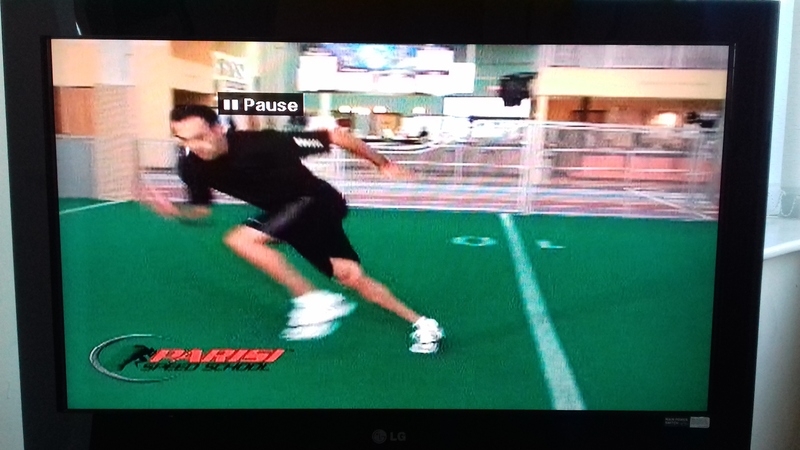 You can see the athlete’s lead leg foot opens up and moves slightly in front of the white line. This is what we call the directional step. It is referring to the repositioning of the lead leg. Some tennis coaches call this the ‘jab step’ but I don’t like this term as it could be confused with the same term used in basketball. This drill was technically a reactive drill- but the athlete had only one choice AND he had quite a lot of time to catch the ball after 1 bounce as the feed was quite close. In my experience if the athlete has to make a choice of going left or right and has very little time you will also see the dig step, which is the repositioning of the back side leg. Gravity step is where a player who is moving in one direction will bring the leg that is towards that direction in under the body. This bending of the knee and bringing the leg inward causes the body to literally “fall” in the direction the person wants to move. This has been shown to actually be the fastest way to get the body at rest to move in the direction of desire. This is something I have observed when the person is in a wide stance- which we will talk about now. 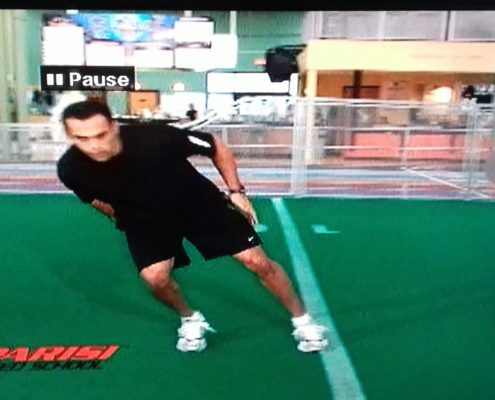 A dig step- also known as a plyo step or false step is often rejected by coaches as a inefficient way to initiate movement because it involves wasted movement away from the intended direction. But Lee Taft and others have championed this step for decades as it is part of the body’s fight or flight response when we have to move somewhere quickly under extreme time pressure. It involves pushing the back side leg away from the intended direction. For me this covers everything else that gets us from A to B that doesn’t involve use of a running step associated with sprinting. This includes side steps and cross-over steps and it also covers the important technical model of changing direction. Before I get the haters I realise that you can still perform things like side shuffles and cross-overs very ‘quickly’ but I have put them in this classification as I want to keep First step speed to strictly sprinting mechanics using the running step. Most sports will utilise one of more of the three types of speed mentioned above. Tennis- uses FSS and a lot of MDS and has the unique aspect of the ‘split step’ which is a jump which precedes the first step. 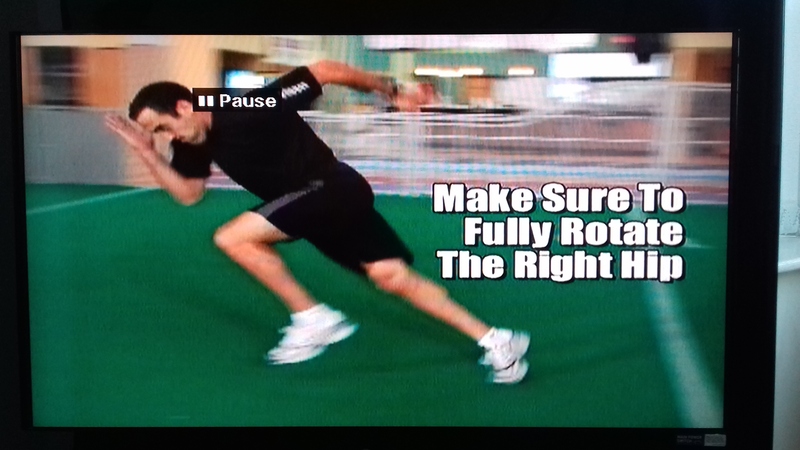 In sport many of the aspects of speed are submaximal because they don’t involve sprinting. But they do require the body to move it’s position quickly. You will see this in the examples below. Basketball- uses a backwards step known as a drop step to pass a defender who is standing behind them. http://athleticperformanceacademy.co.uk/wp-content/uploads/2018/01/acceleration-start.png 339 602 dazdrake http://athleticperformanceacademy.co.uk/wp-content/uploads/2015/05/APA-Logo1-300x156.jpg dazdrake2018-01-30 11:06:322018-05-27 20:11:10What is First Step Speed- who cares? firstly a belated Happy New Year. I resisted the temptation to do a ‘Best of 2017’ Blog post this year and I have previously written about all the Pro team pre-season schedule I have been using over the last few years. You can read more about it here and here. But needless to say December was a busy month working with the pros in their pre-season. As we get back into the normal routine I am turning my attention to the time of year where I always do the Level 2 Certificate in Strength & Conditioning, as well as the Speed, Agility & Quickness Workshop in February. I’ve been running both of these for several years now and it’s always been on my ‘To Do List’ to create a technical checklist for the Speed element of the Level 2 qualification. You see, 1st4sport provide you with a comprehensive checklist of technical points to highlight in your coaching for the Bench press, Deadlift, Squat etc- but there is nothing for the speed component. So I’ve gone away and put some time into this so candidates coming onto the qualification will now have some teaching points that they can highlight in their coaching practicals. I hope you find it useful. 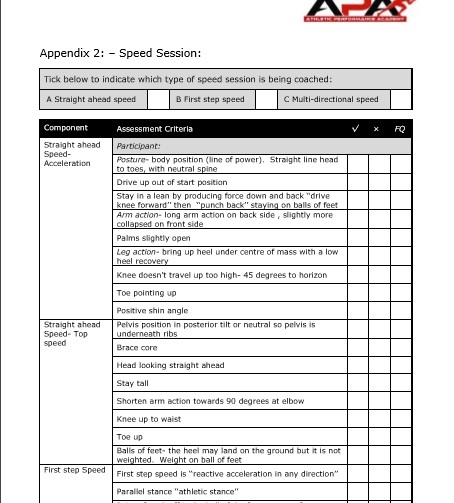 It will be used on the Level 2 qualification as an assessment guide for the assessor to see that the coach has a good understanding of the main technical points associated with each type of speed. 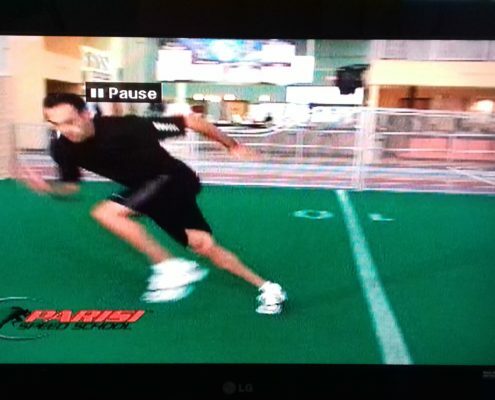 I must give credit to Lee Taft and his excellent resource ‘Complete Speed Training.’ I’d also encourage you to check out Parisi Speed School who produce excellent resources on Speed.